WHAT IF YOUR DAD’S EVIL GIRLFRIEND SENT YOU AWAY? Elsie’s mum left them a few years ago, but that’s okay. Elsie and her dad are a team – or they were until Cindy showed up. Before Elsie knows what’s happening, her dad and Cindy are going on a cruise, while she’s being shipped-off to live with aunts she’s never even met! She soon finds out there’s something strange about her aunts’ café though. The food seems to do funny things to people – and when Elsie discovers its secret, she might discover powers she never knew she had. As if all that wasn’t enough to deal with, there’s a maniac on the loose in her aunts’ village and they’re all in danger! 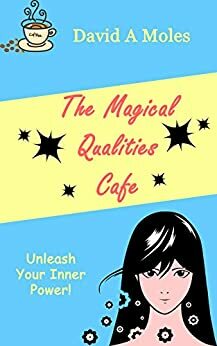 The Magical Qualities Café is a fun adventure and suspense-filled mystery, which will make you laugh one minute and have you on the edge of your seat the next. Dive in to find out whether Elsie and her aunts survive, and to discover whether Elsie can ever win her father back from his evil girlfriend. A good plot - a wicked "sort" of Cinderella story with magical aunts. How does a young girl cope when her father's girlfriend sends her away to the aunts she doesn't know. Good to see that good wins but I do have one criticism - the girl is supposed to be ten but acts more like 14-16 year old. Nevertheless a good read about underhand dealings with a firm message that "good" wins over "evil".